The Flemish Giant is also called the "king of rabbits" because of his large size, longevity, and personality. These giant rabbits can reach an immense size very quickly. By seven or eight weeks of age, Flemish giants can already weigh four pounds or more. A Flemish rabbit is a sweet, lovable companion that can be kept inside, and he blends well into family life. Flemish Giant rabbits have a distinctive look and it's not just their size that makes them stand out among other bunnies. If you want a giant bunny, then Flemish rabbits are a great choice. Flemish bunnies are big rabbits. 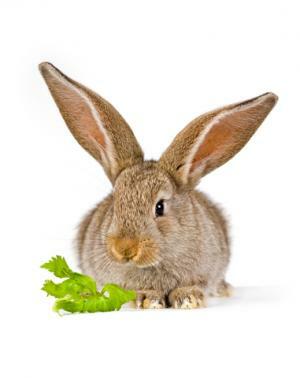 Most fully grown Flemish rabbits weigh around 14 pounds, but rabbits have been recorded weighing as much as 21 pounds. Does may weigh just a bit more than bucks. Does also have a dewlap which is a fold of skin under their chins that gives them a double-chin appearance. The Flemish Giant is generally a docile breed, and these giant pet rabbits make good companions and loving family pets. When kept indoors, they will hop around the house and sit on their owners' laps. They can even be trained to use a litter box. However, these rabbits can grow nervous if they are handled roughly, and they can inflict serious scratch and bites if they feel the need to struggle. So, children should be supervised at all times around them. These are big rabbits, so they need a lot of support if you're going to pick them up. Support their upper body with one arm around the chest and front legs. Wrap your other arm around the lower half and make sure you support the rear legs. Hold the rabbit to your chest gently but securely and make sure you don't squeeze him or he may begin to panic and struggle. If he seems nervous at all, reassure him in a soft, calm voice. If this doesn't help him settle in your arms, gently lower him to the ground or into his pen and release him. The Flemish Giant has short fur. It needs only minor weekly grooming to keep the coat in good shape. Brush once a week with a slicker brush. If the rabbit is molting, brush twice a week. The rabbit will shed its coat twice a year in the spring and again in the fall. The exact time of shedding will vary from animal to animal. The tips of the nails should also be trimmed occasionally unless the rabbit gets enough exercise to wear them down naturally. Like most rabbits, Flemish Giants need a diet composed of large quantities of hay, water and a smaller portion of rabbit pellets. They also should receive fresh vegetables daily and fruit once or twice a week. As far as the amount of pellets, some Flemish Giant breeders recommend free-feeding them as they are unlikely to overeat. Others recommend free-feeding til they are one-year-old and then giving a 1/4 cup of pellets for every five pounds of weight. Vegetables should be fed at a rate of two to four cups for every five pounds of weight daily and fruit only in tiny amounts once or twice a week. For the most part, the Flemish Giant is a healthy breed that lives around five years but can live up into the teens. According to The University of California Agriculture and Natural Resources, larger rabbits are prone to sore hocks. Sore hocks is a condition caused by standing on wire floors or in unsanitary conditions. It is common in breeds like the Flemish Giant. You'll also want to be cautious about feeding your rabbit too many treats to avoid health issues that can crop up if he becomes overweight. The best way to keep your rabbit healthy is to know your pet well enough to recognize when he isn't feeling his best. Early treatment can make a difference in recovery. Take care of your Flemish Giant and he will be an excellent and loving companion. While Flemish can endure cool temperatures, they don't tolerate temperatures over 90 degrees Fahrenheit very well. If they are kept in a cage, they need more room than a smaller breed because of their massive size. Even the door of the cage may need to be larger. They also tend to eat more than smaller breeds. While no one is 100 percent certain of the origins of this breed, some experts suspect that they are descended from breeds raised for fur and meat like Patagonian and Stone rabbits. Others say they descended from the Argentinian Pentagonian rabbits. 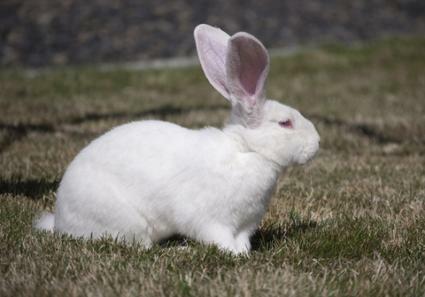 However, Bob Whitman, author of Domestic Rabbits and Their Histories: Breeds of the World, surmises in his book that the Argentinian Pentagonian hare is actually a rodent and cross-breeding would be impossible. His theory is that the breed did descend from breeds from the old Flemish region like the Stone and Patagonian of that area. The breed came from England and Belgium in the 1890s to America. It wasn't until the early 1900s that the breeds started to be shown at livestock shows. In November 1915, the National Federation of Flemish Giant Rabbit Breeders (NFFGRB) was formed. When the beginning of ARBA was formed in 1924, NFFGRB became a part of that association. In 1929, the club created breed standards. Today, the club continues to work toward improving and promoting the breed. Does of this breed mature between eight and twelve months old or when she reaches approximately 14 pounds, and this is the perfect time for them to have their first litter. After a doe turns a year old, her pelvic bones begin to fuse. This makes it more difficult for her to deliver her kits, and a difficult delivery can mean death for her and her unborn kits. The average length of pregnancy is 31 days, and most litters average five to a dozen kits, but some litters are slightly larger. Extremely large litters usually mean that some kits won't receive as much milk as other. Kits that fall behind in their growth before they are weaned typically never develop to their full potential. How Much Does a Giant Flemish Cost? You can expect to spend between $20 to $50 for a Flemish Giant although show quality rabbits can range from $75 to $300 or more. The Flemish Giant website for breeders and owners provides a helpful chart for determining the costs of owning a Flemish Giant, including housing, accessories, and food. 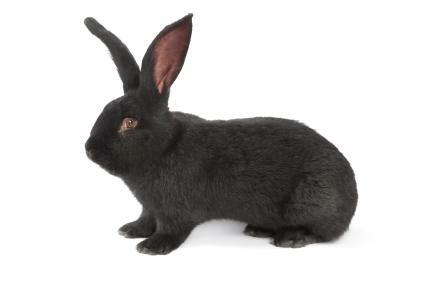 On the low end, you can expect to spend $665 per year caring for a single Flemish Giant rabbit as a pet and around $2,700 for a show quality bunny. 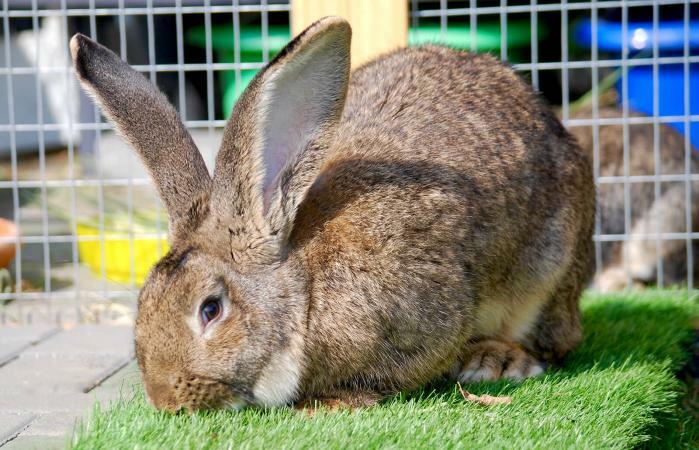 If you decide that a Flemish Giant might be a good pet for you, the next step is to make appointments to visit a few breeders and get to know some of these rabbits in person. Although each breed has certain characteristics, each rabbit within that breed is still an individual with its own personality quirks. Take your time before you make a commitment to bring one of these rabbits home to make sure the two of you will be compatible throughout the years to come.